This little building is situated just to the north of Southwold and Reydon's urban sprawl. Actually, that makes it sound rather suburban, and it isn't at all, for the tiny lanes that spread between here and the curiously named Frostenden Bottom are as narrow, overshadowed and remote as any you'll find anywhere up here in the north east of the county. 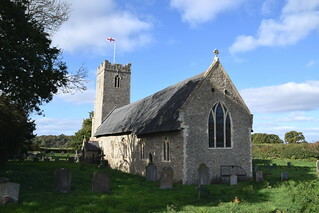 The village here is called South Cove to distinguish it from Covehithe, formerly simply Cove, rather than from North Cove which is away on the Norfolk border. 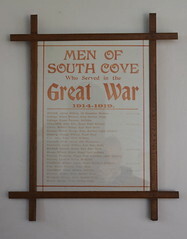 There isn't really much of a village here at all, and when I first visited in 1998 there was only one service a month. 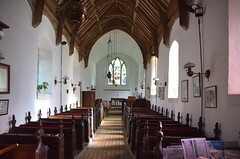 But this is as pretty and as well-cared for a church as you could wish, and despite its location on the busy Southwold to Wrentham road it has a lovely setting beside a farmyard, and like all thatched churches looks very fine. If you've ever seen the film Iris, the story of the writer Iris Murdoch, you may recognise it as the church where she gets married. 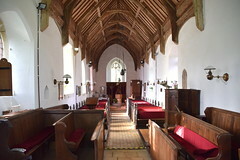 You step from the trim churchyard through the fine Norman south door into a thoroughly Victorian interior, reminiscent of Uggeshall and Sotherton. It has aged well; someone with imagination worked here. The interior is narrow, with a fine medieval roof, and the Victorianisms shouldn't distract us from the fact that this is essentially a Norman building, with much surviving evidence. Isn't it strange how you can never really disguise a Norman church? You can punch its walls with Dec and Perp windows, you can add an elaborate tower at the west end, you can fill it full of pitch-pine pews, but it still retains that essential Norman-ness. 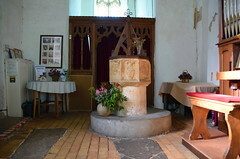 There's a typical East Anglian font, in pretty poor condition. The central gangway widens towards the west, which is rather pleasing. 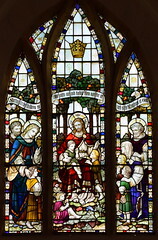 The modern reredos includes a gridiron, the instrument of St Lawrence's gruesome torture. 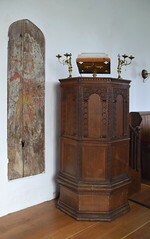 Part of the medieval roodscreen survives, with apparently medieval painting at the top, but no images on the panels of the dado. The great treasure of the church has been well-preserved. 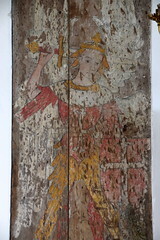 It is a large piece of wood, two planks in fact, set in the entrance to the rood loft stairs, and on it is painted the archangel St Michael triumphing over a dragon. It may well have been that rood loft stairways originally had doors - indeed, hinges survive at some churches. But there is no getting away from the fact that this does not look like a door. There is no handle, and no hinges, for a start. So, what is it? If there isn't a door, then you fit panels into the space, and then plaster over it. I'm guessing here, but I think that when the Victorians went about their business resacramentalising the churches of England and Wales, they deliberately opened up rood loft stairs to restore a sense of the medieval. Some stairway entrances had been filled with rubble. But mostly, they'd been covered over, and plastered. You'd find them by the hollow sound when you tapped them. The Victorians stripped back the plaster, removed the panelling, burnt it, and thought no more about it. Except here. The Victorians seem to have discovered something rather remarkable and exciting (it simply isn't credible that this image survived the long puritan nightmare of the Church of England on display). I think this image spent several centuries under plaster - note the damage done by a sharp instrument. At first sight, you might think that this is an example of protestant iconoclasm. But it isn't. A professional plasterer friend of mine tells me that this is what you have to do to wood to get the plaster to stick to it. So, we must ask ourselves: what was this panelling originally? Was it a door? Or was it put there in the 1540s to block the rood loft off? And if so, where was it taken from? Was it originally from a doom tympanum, as at Wenhaston? I couldn't help being reminded of the wonderful archangels on the rood screen at Ranworth in Norfolk. 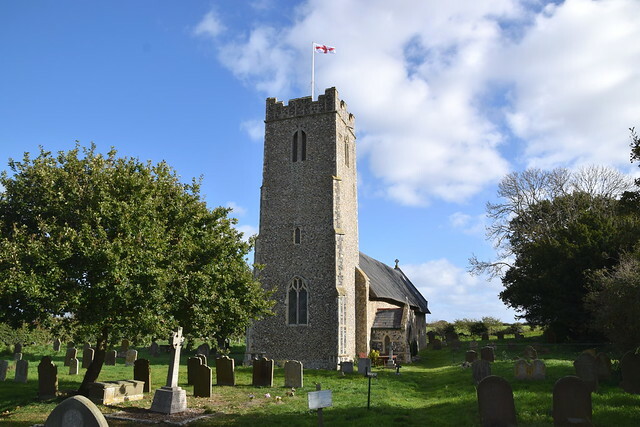 Could it have come from one of the Dunwich churches before it was lost to the sea? I suppose we'll never know.